Joseph Galazzo is one of a handful of players who won their way into the WPT Five Diamond via satellites on playMGMpoker. If you look at Joseph ‘JOEYdaMUSH’ Galazzo’s Hendon Mob profile, a couple of things stand out. The first, all of his cashes are in East Coast tournaments. Most are at Borgata. Some are at Parx. 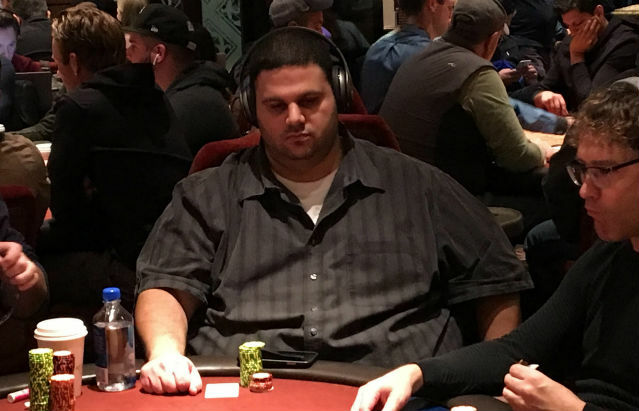 The second, is about a month ago he hit a $110,011 cash after posting a second-place official finish in the Borgata Fall Poker Open opening event. It was his biggest score ever. Thanks to a $535 satellite win, Galazzo has a chance to change both of these this week in Las Vegas at the World Poker Tour Five Diamond Classic. The 37-year-old, ranked #52 in New Jersey, won his seat on playMGMpoker.com. He tried working his way up through the steps, but couldn’t make it happen, so he bought straight into the Super Satellite. “I jumped right in. I tried to ladder up a couple of times, because they had those $55 ones, and I couldn’t make any tickets out of those. I think it was the third one that I played because they had five or six. Third time was a charm,” said Galazzo. The win allowed Galazzo to head out to Las Vegas for the first time in his career. The boost to the bankroll was nice, but Galazzo also admitted that getting that deep in a big event came with a confidence boost that he’s hoping pays off this week. He was one of 400+ players seated at the start of Day 1 and said all the nerves were gone after the first few hands. “I have a pretty good table. I have Mohsin Charania on my left, but I’m trying not to get mixed up with him too much. Everybody else I don’t recognize,” said Galazzo, who also has ClubWPT qualifier Bill Mynatt at his table, which has made things interesting. “He’s limping a lot of pots and it’s making for an interesting dynamic, because everybody’s trying to iso him and I actually paid him off, three streets, he flopped top two on me, I had ace-king and paid him and the camera was rolling. I don’t mind – he seems like a good guy,” said Galazzo. Almost immediately upon landing, Galazzo did something that is almost a rite of passage for Las Vegas virgins. He hit up the In-N-Out burger. That wasn’t the only touristy thing he’s done since getting into town on Monday night, but he doesn’t plan on doing too much – he wants to save some for a return trip. Even though it’s six months away, Galazzo believes now is the time to make his WSOP debut. “I just feel like I’m playing really well, and it’s just such good value tournaments, not just at RIo, but also at Venetian and Planet Hollywood and just try to cash in on playing well,” said Galazzo.